Single hook simple handbag display adjusts in height from 14" to 25"H. Economy, lightweight display stand. Color: chrome. 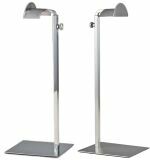 9"W Double hook handbag display adjusts in height from 17" to 29"H. Economy display stand. Color: chrome. Curved bar support follows natural shape of handles and designed not to change shape of handbag handles. Height adjusts in height 14" to 26"H, base 8" square. Color: rose gold finish. Single hook counter handbag stand. Height adjusts in height 14" to 26"H, base 4"x6". Color: rose gold finish. 9" W Double hook handbag display adjusts in height from 16" to 28"H. Economy, lightweight display stand. Color: chrome. Curved bar support follows natural shape of handles and designed not to change shape of handbag handles. Height adjusts in height 14" to 26"H, base 8" square. Color: chrome. This purse rack is perfect for hand bags, purse. Individual adjustable waterfall arms let you accommodate up to 5 bags with an easy access to any of them. Holds 40 handbags total. Each push-button arm extends from 48'' to 72'' every 3". Floor space footprint 3 1/2' x 3 1/2'. Weight: 32 lbs. Color: chrome. Floor freestanding purse display is perfect for hand bags, purses. Individual adjustable straight arms let you accommodate up to 5 bags with an easy access to any of them. Holds 40 handbags total. Each push-button arm extends from 48'' to 72'' in 3" increments. Weight: 30 lbs. Color: chrome. Floor freestanding purse display is perfect for handbags, purses. Individual adjustable straight arms. Rectangular tubing arms have a more upscale look. Holds 40 handbags total. Each push-button arm extends from 48'' to 72'' in 3" increments. Weight: 39 lbs. Color: chrome. Floor freestanding purse display has compact design. While base stays intact, arms easily detached for moving around. Holds 20 handbags total. Each push-button arm extends from 48'' to 72'' in 3" increments. Weight: 32 lbs. Color: chrome. Single 3" arm handbag display adjusts in height up to 18". Color: chrome. Single arm handbag display adjusts in height from 24" to 42". Clear acrylic base. Color: chrome. Single hook display stand adjusts in height from 18" to 36" with heavy weight 6" dia round base. Color: chrome. Single hook display stand adjusts in height from 18" to 36" with heavy weight 8" dia round base. Color: chrome. 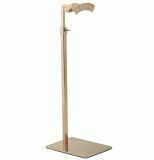 Single hook display stand adjusts in height from 18" to 36" with heavy weight 10" dia round base. Weight: 4.5 lbs. Color: chrome. 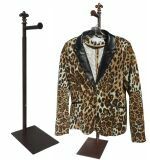 Single hook display stand adjusts in height from 18" to 36" with heavy weight square base. Color: chrome. Single 3" arm handbag display adjusts in height from 17" to 26". Color: chrome. T-bar handbag display adjusts in height from 14" to 25". Top bar is 13"L. Base is 7"x7". Color: chrome. Counter display for a handbag with 4" long top arm. Interconnecting pipes design mix modern, and retro looks into edgy style. Height adjusts from 16" to 26". Wood base 6.5"X8.5". Color: grey. Weight: 3 lbs. Unique slant, contemporary purse display with 4 pockets 2.75" deep each. 11"L x 4"W X 8"H. Color: acrylic. Single hook display stand adjusts in height from 27" to 40" with 6" base. Color: chrome. Clutch bag holders has three 4"W X 3"D compartments. Dimensions: 9.5"L X 5"W x 6.5"H. Color: black. Clutch bag holders has three 4"W X 3"D compartments. Dimensions: 9.5"L X 5"W. Color: grey. Floor freestanding purse display has compact design. 72"H x 17"W. Holds 14 handbags total. Color: copper. Floor freestanding purse display has compact design. 72"H x 17"W. Holds 14 handbags total. Color: creamy pearl. Floor freestanding purse display with decorative top finial. 72"H x 17"W. Holds 14 handbags total. Color: copper. Two hook handbag display adjusts in height 17" to 29"H, base 7" dia. Economy, lightweight display stand. Color: silver chrome. Counter hook stand adjusts from 27" to 40". Display any bag; 10" X 7" oval base. Weight: 5 lbs. Color: grey. Counter purse display with 1 pocket 3" deep opening. Color: clear acrylic. Floor freestanding shopping bags rack has compact design. 45"H Color: chrome. 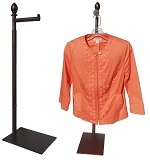 3 hook handbag display adjusts in height up to 16" to 28"H, base 7.5" dia. Economy, lightweight display stand. Color: chrome. Mini female form is made from easily pinned foam and covered in velvet material. Countertop form great size for fashion accessories: scarves, necklaces, purses. Colors: black, white. Square top display acrylic risers. Set of three includes: 8"W x 8"L x 6"H; 12"W x 12"L x 8"H; 16"W x 16"L x 10"H. Color: clear. 5"long single arm, counter stand adjusts in height from 24" to 36", base 9" deep x 6-1/4" wide. Display any handbag or hanger. Color: creamy pearl. 5"long single arm, counter stand adjusts in height from 24" to 36", base 9" deep x 6-1/4" wide. Display any handbag, hanger. Optional finial top of your choice. Color: creamy pearl. 5"long single arm, counter stand adjusts in height from 24" to 36", base 9" deep x 6-1/4" wide. Display any handbag or hanger. Color: copper. 5"long single arm, counter stand adjusts in height from 24" to 36". Display any handbag, hanger. Optional finial top of your choice. Color: copper. 5"long single arm, counter stand with decorative finial. Height adjusts from 24" to 36", base 9" deep x 6-1/4" wide. Display any handbag or hanger. Color: copper finish. 5"long single arm, counter stand adjusts in height from 24" to 36", base 9" deep x 6-1/4" wide. Display any handbag or hanger. Color: raw steel. 5"long single arm, counter stand adjusts in height from 24" to 36". Display any handbag, hanger. Optional finial top of your choice. Color: raw steel. 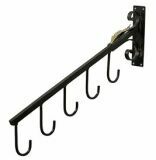 Slant wall mount 5-hook handbag holder. Color: grey. This slant faceout screws directly into wall and traditionally used to display handbags and any products containing a strap. Wallmount backplate. Screws not included. Color: chrome. Slant style 5-hook handbag holder mounts directly into the wall. Color: aged charcoal. Attractive oval 12" X 19" dia glass top pedestal. Adjustable in height from 32" to 48" tall. Designed for displaying handbags, shoes, jewelry, fashion accessories. Unique slant, contemporary purse display with 5 pockets 2.75" deep each. 16"L x 4"W. Color: acrylic. Freestanding floor grid panel with legs. 73"H x 20"W x 24"D. Gridwall accessories sold separately. Color: grey. Weight: 29 lbs. Gridwall slant purse 5-hook handbag display arm. Color: grey. Plastic hand display with poseable fingers is an eye catching rings, bracelets, necklaces prop, handbag and scarf display. 11"H, height adjustable. Color: faux wood, black base. Plastic hand display with poseable fingers is an eye catching rings, bracelets, necklaces prop, handbag and scarf display. 11"H, height adjustable. Color: faux wood, white base. 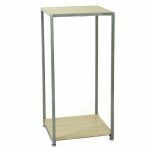 Display pedestal can hold handbags, shoes or any fashion accessories. Acrylic clear round top 15"dia, four metal legs 10"H. Color: acrylic, chrome. Gridwall waterfall 5-Hook faceout, square tubing. Colors: black, white, chrome. Slatboard waterfall 5-Hook faceout. Colors: black, white, chrome. Slatboard waterfall 5-Hook faceout, rectangular tube, slant. Colors: black, white, chrome. Slatboard straight 5-Hook faceout, upscale rectangular tube. Colors: black, chrome. Gridwall slant 5-Hook faceout, upscale rectangular tube. Colors: black, white, chrome. T-bar handbag display adjusts in height up to 25". Top bar is 9"L. Color: chrome. 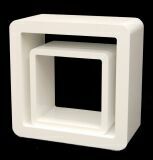 Set of 2 cubes includes: large cube 24"Hx24"Lx12"D and small cube 16"Hx16"Lx12"D. Color: glossy white. Set of 2 cubes includes: large cube 24"Hx24"Lx12"D and small cube 16"Hx16"Lx12"D. Color: glossy red. Display cube 14" X 14" square, made of laminated particle board. Sold individually. Colors: maple, black. Display rack with inside shelf shaped as a dress form. Designed to display shoes, scarves, any accessory but clothes. Color: copper finish. Display rack with inside shelf shaped as a dress form. Designed to display shoes, scarves, any accessory but clothes. Color: creamy pearl. 3 Shelf display unit 34"H. Shelves 14" X 13". Color: dark grey. 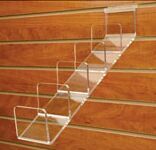 5 shelf display unit 54"H. Shelves 14" X 13". Color: dark grey. 4 Level gorgeous display tower. 72"Tall X 18"W X 18"D. Each glass shelf is 16"W X 18"D. Weight: 40 lbs. Color: grey. Maple wooden display cube. Contemporary & functional display combines maple shelves with metal frame. 24"High X 17" wide X 17"D shelves. Color: maple wood; silver frame. Maple wooden display cube. Contemporary & functional display combines maple shelves with metal frame. 30"High X 17" wide X 17"D shelves. Color: maple wood; silver frame. Maple wooden display cube. Contemporary & functional display combines maple shelves with metal frame. 36"High X 17" wide X 17"D shelves. Color: maple wood; silver frame. 17"L Slatboard waterfall 5-Hook faceout, rectangular tubing. Sold in full cases of 24 pcs/case. Color: satin chrome. 15"L pegboard faceout with 5 hooks. Color: chrome. Fake snow create believable window, floor displays. 5 lbs of real snowflakes. Fire resistant, 1 lbs covers 20 sq feet. Multi-use and application only limited to your imagination. Color: white. Create unlimited displays with this vinyl sheet. Window backdrops, tradeshows applications, store deco. Wrap, cut, shape, glue, fold, staple for endless display possibilities. 10 yard long x 36"W roll. Colors: white, metallic silver, metallic red. Create cool counter displays with freestanding 12"H plastic hand. Use them next to handbags, purses to give a realistic feel to fashion accessories. Colors: fleshtone, white, chrome. Accessorize with this freestanding 15"H plastic hand to draw attention to handbags, purses, scarves, jewelry. Colors: fleshtone, white, chrome.